Join us for our 8th annual casino night fundraiser and siletn auction with proceeds primarily devoted to AZ Lions Camp Tatiyee. Location: Mountain Brook Village, 5674 S Marble Drive, Apache Junction, AZ. 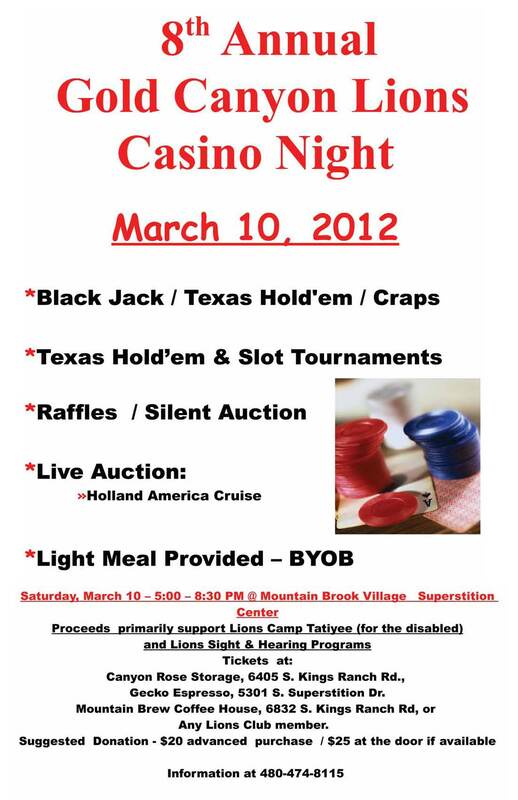 The evening will include a light meal, silent auction, casino style games by On the Go Casino®, prizes and lots of fun. For more information and to purchase tickets visit Gold Canyon Lions or contact us at 480-474-8115.